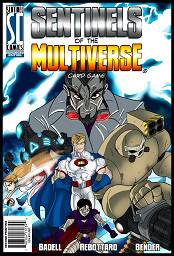 Everyone's favorite superhero themed card game Sentinels of the Multiverse has been released on Steam. It is the same game we have been playing on Android and iOS brought to your PC courtesy of Handelabra Games. The game essentially breaks down to a cooperative multiplayer game. One or more players select up to four super heroes out of the ten that come with the game. You then select one of the four super villains and one of the environments. More of all of these things are coming in expansions. Each hero, villain and environment has a deck. Everyone takes turns playing cards from their deck. The key is figuring out how to use the heroe's abilities in concert to defeat the common enemy. Lots of fun, and even more so in the digital version where players are freed from finicky tokens, math and bookkeeping. This one wins kudos in my book for having a unique and original theme along with a development team devoted to delivering a quality experience. Look this one up if you are searching for something new to play. Tuesdays, 8pm eastern - Learn to Play Sentinels of the Multiverse with the game devs on the Handelabra Games Twitch Channel. Archived Twitch videos. Handelbra Games have released a major update and the first expansion pack entitled "Mini-Pack 1" for their digital adaptation of the card game Sentinels of the Multiverse. The expansion contains the hero Unity, the villain Ambuscade and the environment Silver Gulch, costs $1.99 (or $19.99 for the season pass) and is available as an in app purchase. More information about the update, expansion, and availability of soundtracks is available on the Handelabra Handle-La-Blog in this post. More information regarding future expansions and what is included in the aforementioned season pass is available here. Tuesdays, 8pm eastern - Learn to Play Sentinels of the Multiverse with the game devs on the Handelabra Games Twitch channel. You can watch past videos: here and here. The Rook City expansion was released for the digital version of Sentinels of the Multiverse and is available as an in-app purchase for $4.99, or as part of the season pass for $19.99. Tuesdays, 8pm eastern - Learn to Play Sentinels of the Multiverse with the game devs on the Handelabra Games Twitch channel. Past Broadcasts: Archived Twitch videos and Handelabra on YouTube. 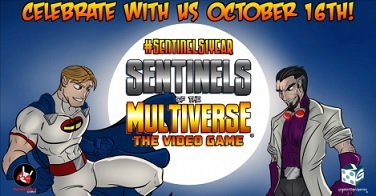 Handelabra Games will be holding an online event October 16-18 celebrating the one year anniversary of the digital edition of Sentinels of the Multiverse and the addition of a cross-platform online multiplayer feature coming to all versions that weekend. During the weekend event the game will be on sale for a reduced price on all platforms, and $1 from every purchase will go to childsplaycharity.org. 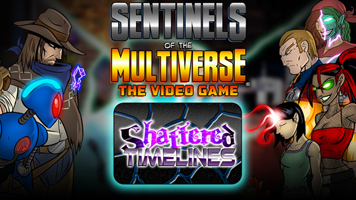 The Shattered Timelines expansion for digital versions of Sentinels of the Multiverse is coming this Friday, January 29th along with the version 1.7 update of the game. The 5th content pack and 3rd full expansion, Shattered Timelines tells the story of alternate worlds colliding with the one we know and love. Heroes become villains, villains become heroes, and environments blend and crumble around you in this expansion. Like the previous full expansions Rook City and Infernal Relics, Shattered Timelines includes 8 new decks. The new hero decks included in the Shattered Timelines expansion are Chrono-Ranger and Omnitron-X. The new villain decks are The Dreamer, Kismet, La Capitán and Iron Legacy. The new environments are Time Cataclysm and The Block. As usual the new update and expansion will also include some new alternate art variant cards to unlock. The version 1.7 update also brings a new achievement system to the game, along with achievements attached to each unlock-able variant card.